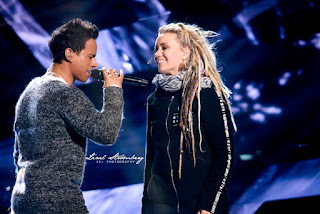 With one night left till the finals, this year's Melodifestivalen finalists took to the stage for a live dress rehearsal in Friends Arena complete with an audience of fans of the contest to better enhance the authenticity of the experience before the actual finals. We caught up with a few of the artists at a press conference following this rehearsal show in order to see how their run-throughs went and how they are feeling leading into the culmination of months of preparation. Jon Henrik Fjällgren has qualified direct to the finals both times competing, with a particularly strong wave of support from the northern region of Sweden. He has timed this second time in the contest with the release of a new album. "The album is a story about my past and story about who I'm living now. It's a lot of songs bout the war that's going on for the Native people in the world. It's really deep stuff." Anton Hagman defied the odds to win his Andra Chansen duel against Loreen and qualify to the finals. Though he entered the contest with a respectable following from posting covers on his YouTube channel, he was largely unknown to the general public and international audience. "It's a lot bigger here than it is in the other cities. I'm very happy. I'm not happy that I beat Loreen; I'm happy that I know there's so many people supporting me to bring me to the finals." Benjamin Ingrosso is another debutant that has made it to the finals, and all the while maintaining a positive attitude and great enthusiasm for the experience. "I think it went good. I was performing for the audience this time because I knew that the camera wasn't on. I did my best and I tried to have so much fun. I know that the jury watched me but I didn't watch the camera." Robin Bengtsson has made a few revisions to his performance for the finals, including changing the F-bombs to the word "freaking" and removed the crotch shot. "It's genuinely gone. I'm going full-on "freaking" cause I'm a full-on freak." New Poster for Lost City of Z!